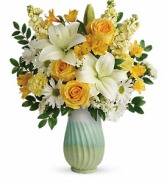 Celebrating the reason for the season with meaning, blooming elegance, and perfect beauty, this gorgeous holiday centerpiece is an exceptional way to bring light and Christmas joy to your holiday gathering. FTD® has partnered with DaySpring® to bring you this special collection to help you "Live Your Faith" throughout the Christmas season. 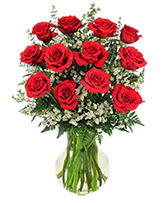 White roses, Star of Bethlehem, chrysanthemums, and mini carnations draw the eye in, surrounded by an assortment of fresh Christmas greens. 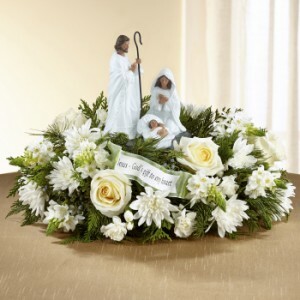 Arranged elegantly around a keepsake nativity figurine featuring Mary, Joseph, and Baby Jesus, with an accent piece among the flowers that reads "God's Gift of Love." 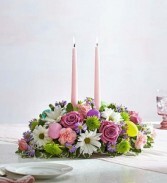 This centerpiece is a wonderful way to share in the good news with friends and family near and dear to your heart.